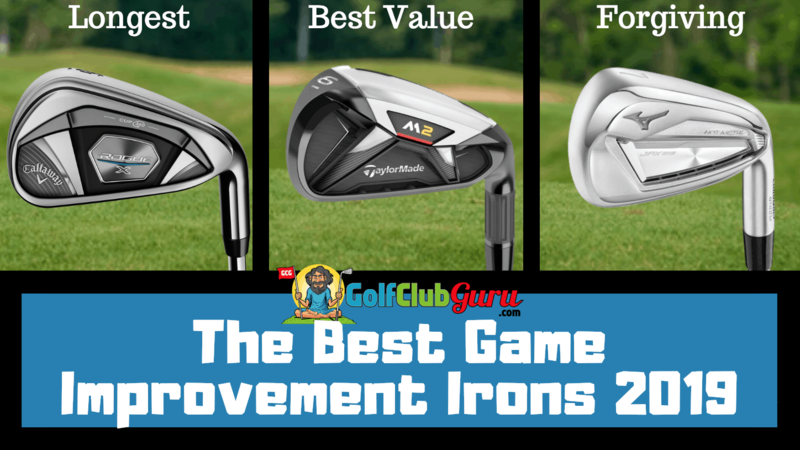 Game improvement irons are the perfect middle ground. They are easier to hit than players irons. They are more forgiving due to perimeter weighting. They are designed to go as straight as possible. They are much more attractive at address than super game improvement irons. They have slightly thinner toplines and soles. They are plenty forgiving, but they aren’t too large to be unattractive and clunky. Super game improvement irons often times will get caught up in the rough if they are too large. In my opinion, way more players should be playing game improvement irons. I see far too many golfers playing a small, compact iron. Sure, players irons feel better at impact and allow you to curve the ball more, but most golfers need the extra forgiveness. In short, game improvement irons get a bad rap. Unless you are a low handicap golfer, though, you are making the right decision. Finding the best game improvement iron for you can be difficult. For that reason, after trying all of the clubs that I can get my hands on (just about everything I could ever want to), I like finding the best irons for certain categories. Readers can then determine which characteristic is most important to them. Let me know in the comments below if you would like some help picking the best iron set for you. Note: all links and pictures will send you to eBay, by far the best website for buying irons in my opinion. According to a study done by golfclubguru.com, roughly exactly 103% of golfers want to hit the ball longer, even with irons. This was a double blind study (one in which participants closed both eyes to answer). If you are part of this group, I’d suggest the Callaway Rogue X irons. They are BY FAR the longest irons ever made. You wanna know why? They have really strong lofts. Yep, that’s right. Callaway didn’t find a miracle material that shoots golf balls off the club face 2x faster. They simply took their older models (which were already really long) and then decreased the lofts a little to make the ball travel further. So, if you simply want to hit your 9 iron 150 yards instead of 140 yards, this is your set. You don’t need to read any further, I promise. It doesn’t get any better than this right here. In all seriousness, everyone goes through a period in their golf career where they want to hit the ball further. I’m still in that period, as it’s addicting to improve the distance you hit the ball. The downside: this set of Rogue X irons will be a little difficult to control (when it comes to distance). You’ll hit some shots far longer than you wanted, and some far shorter. Therefore, if distance control is important to you, I would look elsewhere. This is a tricky category. We are looking for the most forgiving game improvement club, but it can’t be a super game improvement club (we’ll leave that for another article). In my opinion, the winner in this category so far in 2019 is the Mizuno JPX 919 Hot Metal irons. Mizuno has really been gaining a lot of market share in the game improvement iron category in the last few years. I’ve been gaming the JPX 825 irons for years, and I can’t explain how happy I am with that purchase. If I were on the market for a new set of irons, this is more than likely the set that I would get to improve my ballstriking. I’ll be upfront, though: these are a little pricey. If you don’t have the money right now, I would invest in an older set of Mizuno JPX irons. The JPX 919 Hot Metal irons are the #1 set that I would recommend to mid to high handicap golfers if they have to money, though. It’s the best combination of distance, forgiveness, and feel. The feel/sound of a well struck shot will blow you away if you’ve never experienced it before. The toplines and soles are not too thin, not too thick. The perfect, happy medium. I’d be impressed if anyone could find negative (or even neutral) review of this set of irons. Trust me: I’ve tried. If you are like me, you like shopping for the best value items, and that includes everything golf related. I would say that, at the current moment, the TaylorMade M2 irons (the old ones, not the newer ones) are the best value game improvement irons on the market. They are a couple of years old, but perform just as well as the new M4 irons (which are at least double the price). Unless a company truly hits a home run on a new release, I see no reason to pass over their slightly older models. The extra price is hardly worth the small improvements year to year. The M2 irons were possibly the best performing game improvement irons when they were released. They ware super easy to hit. Balls tend to fly high and straight, no matter where you hit them on the club face. For those that struggle with hitting the center of the face, you’d be making a mistake by not getting a set of irons with a large sweet spot like this set. The sole is larger than most irons, meaning that you don’t have to make perfect contact with the ball to avoid hitting it fat or thin. The sole is more likely to bounce off the ground (not dig into it) and still result in decent contact. Believe it or not, Wilson used to be THE best company in golf. It has slowly lost market share over the years, and they don’t invest as much money into clubs and marketing as Callaway, Titleist, and TaylorMade do now. However, they still make fantastic clubs (especially for mid to high handicappers) at a crazy low price. For that reason, I consider them to be one of the most undervalued or underrated brands in golf. If you are on a tight budget, I would suggest the Wilson D300 irons. The will perform nearly just as well as clubs 3x the price. Sure: they won’t be QUITE as long or QUITE as forgiving. But they will be close… real close. If you ask me, the extra savings on these irons could be better spent on lessons to improve your golf swing. Bam… it’s a win-win. Good irons. Good golf swing. What do you think? Did I miss a set of unbelievable irons? Let me know what you play in the comments below! I have to express my affection for your kindness supporting individuals who actually need guidance on that theme. Your special commitment to passing the solution all through had become quite insightful and has regularly helped regular people just like me to arrive at their ambitions. Your amazing important suggestions means this much a person like me and substantially more to my office colleagues. Many thanks; from all of us. Game Improvement (GI) irons simply hide problems, they won’t really improve your game. However, in hiding problems GI irons can definitely improve your scores. If you are the type of player that seldom practices and plays two or three times a month, then you will probably appreciate the advantages that GI irons provide (better distance on off-center hits, better distance overall due to thinner faces and fairway-wood construction, reduced vibration on off-center hits). Hello there! This is my 1st comment here so I just wanted to give a quick shout out and tell you I really enjoy reading through your posts. Can you recommend any other blogs/websites/forums that go over the same topics? Thanks a lot! This is the perfect webpage for anyone who really wants to find out about this topic. You know a whole lot its almost hard to argue with you (not that I actually would want to…HaHa). You certainly put a new spin on a topic that has been written about for decades. Wonderful stuff, just great!